Allied is proud to be the premier installer of patio covers in Texas. We’ve helped hundreds of homeowners with this cost-effective way to add living space to their homes! When built properly, patio covers should look like they came with the house and were not added after the fact. That’s why Allied customizes patio covers to match the character of each home. We offer seamless integration between your cover and roof to ensure the addition we install adheres to your personal standards and any HOA requirements. Shingle matching – We match the exact texture, color and shape of your existing shingles for a smooth transition between your roof and new patio cover. James Hardie® siding – High-quality siding protects your home from the elements. Our entire team receives quarterly training on the best practices for installation and maintenance of James Hardie siding. House wrap – We install this barrier to block air penetration and prevent water from leaking into your patio cover, roof and home. Cutting back into the roof – This process is like surgery on your home. We identify the best way to “stitch” your roof and patio cover together so the “bumps” and “scars” don’t show. Just like surgery, you must have trained people with experience and technical knowledge to ensure it’s done right! Allied specializes in wood patio covers because they offer the perfect blend of style and strength that our customers enjoy. No synthetic material can compare to the natural beauty of wood, with its rich colors and captivating grain patterns. Wood is also the perfect choice from a practical standpoint. 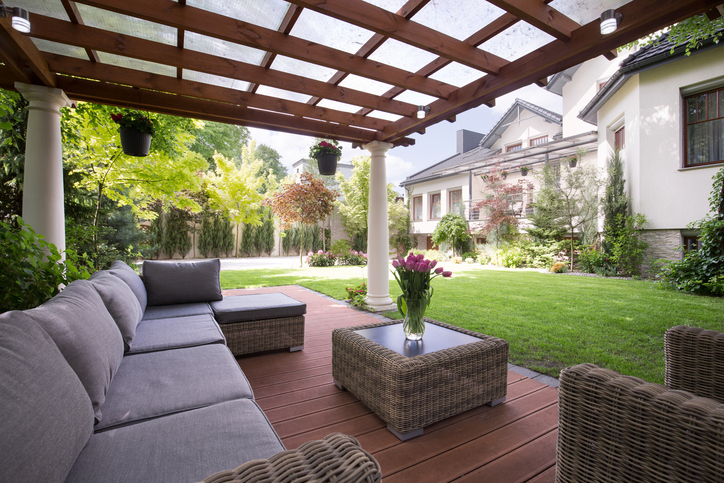 Wooden patio covers are easily painted or covered in siding to match the rest of your home. Plus, wood is a timeless material that is always in demand and may boost your home’s resale value down the road. Metal often feels too industrial for the average home, especially with lattice and slat designs. It also becomes uncomfortably hot to the touch after hours of baking in sun. Vinyl patio covers can look cheap regardless of cost. Because they’re made of plastic, they cannot be altered to replicate the look and feel of wood, and producing them is bad for the environment. Fabric generally provides partial shade and does not fully protect your patio from the elements. Cloth and canvas can also buckle under the weight of rain or leaves if improperly installed or maintained. As you can see, wood is the clear winner!